Every week I pull down some offensive line (OL), defensive line (DL) sack stats from Football Outsiders and create these OL vs DL ratings. Well, sack ratings and pass protection ratings really. I use this to help me find team defenses to stream each week. Which is also useful when searching for cheap team defenses on FanDuel and DraftKings. ARI: They get SF who's giving up the 8th most points to opposing DST. BAL: They are red hot on defense and get the woeful Browns. WAS: Another defense on the rise versus the Vikings beat up offensive line. CAR: KC is very efficient so I'm not reaching for CAR unless the other DST streamers are gone. If you like this you'll love my receiver heat map for week 10. Outside of Dak and Eli I'm not trusting the quarterbacks with the best pass protection ratings. But the wide receivers on the other hand, yes please! Cheap and low owned wide receivers on the following teams should enjoy extra time to get down field in week 10. 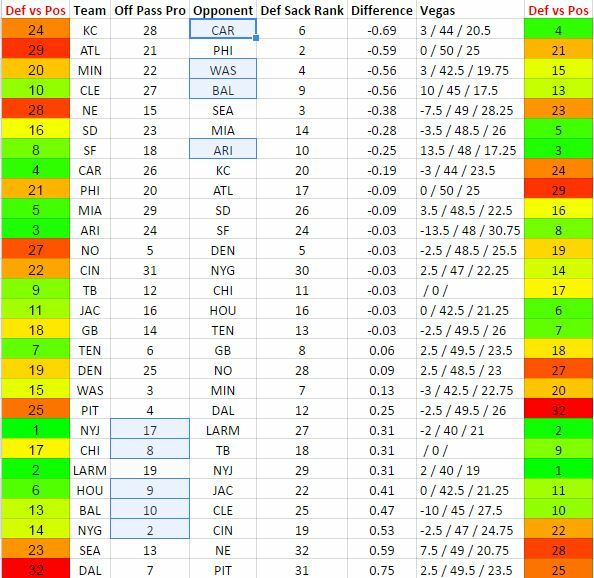 Week 10 pass protection / sack ratings.